Customer research offers insights into the drop in financial product usage. According to the Global Findex, the percentage of adults in Mexico who are saving money at a formal institution plunged from 15 percent to 10 percent in just the past three years—despite financial inclusion strategies enacted by the government. This steep decline in usage of savings accounts came as a surprise, and hit close to home for me as a Mexican. This trend is a cause for concern, and it’s also a call to action. At Accion, we took this as an opportunity to listen to the people we’d like to see benefit from financial services. With support of MetLife Foundation, we wanted to understand why fewer people were saving in banks, what products and services people were using, and who was providing those services if it wasn’t formal institutions. 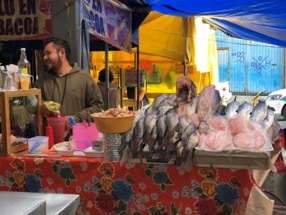 Fish market on San Gregario Street in Xochimilco, a southeastern municipality of Mexico City, one of the places we visited for our user research. aspirations, how they feel about various types of financial services, the strategies they use to stay financially healthy, and more. Our biggest surprise? The individuals we talked with know about and can access a lot of financial products—they just aren’t using them. Lack of alignment between what low-income customers want and what financial products offer is a factor preventing further financial inclusion in Mexico. All of the individuals we spoke to reported having access to microloans, consumer store credit, credit cards, and savings accounts. Financial access didn’t seem to be an issue for them — not even in the more rural areas we visited two hours outside the city. Even though our small, qualitative study may not be rigorous enough to extrapolate to the broader population, this finding seems to be consistent with national data. In Mexico, 86 percent of banking branches are located in urban areas, so people close to the city are unlikely to deal with a shortage of services. What our interviews revealed is that a different issue is preventing further inclusion: lack of alignment between what low-income customers want and what current financial products offer. Most people we talked to dislike dealing with large commercial banks, and they continuously decline the offers for financial services they regularly receive, at their doorstep or in public places. Azucena is a former bank teller, however she prefers to save money at home. Alpuyeca, Morelos, Mexico, 2018. Many of the people we interviewed still prioritize saving cash at home, even if they also have a formal savings account. 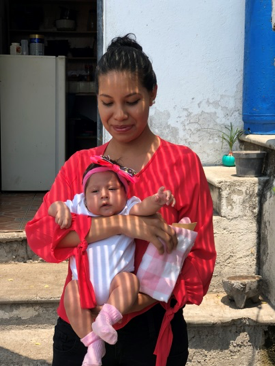 For example, Azucena, a former teller at a large commercial bank branch, told us that despite her relationship with a bank, she and her husband still prefer to store cash informally. “We save at home, but we do so separately, using different lock boxes for different purposes,” she says. Through our conversations with clients like Azucena, we discovered that informal alternatives like lock boxes continue to be more convenient for clients and preferable to formal options. Keeping cash at home is, after all, indispensable for unexpected emergencies. If your money is in a bank, you’d have the hassle of getting there and waiting. Plus, it may not be available 24/7, and you can run into issues if the ATM is offline or the pharmacist, mechanic, or whomever you’re turning to for help doesn’t take a debit card. In many cases, the interviewees’ savings accounts had been opened for them by former employers to serve as payroll accounts or by the government for disbursement of benefits. These accounts were less “savings accounts” and more “distribution accounts” that were immediately turned into cash and saved at home. Because the savings aspect wasn’t used—in fact, was never emphasized—once they switched jobs or stopped receiving benefits, they let the accounts lapse. Convenience may be a key issue, but it is not the only one. Feeling unsafe withdrawing money from a bank branch is also an issue because thieves wait where the money is—outside bank branches and near ATMs. The lack of trust our interviewees placed in financial institutions was often less about security and more about the unclear, high (real or perceived) maintenance fees banks charge on savings accounts. Despite this perceived aversion to formal accounts, we found that people still continue to save and set high financial goals for themselves. In all the interviews we conducted, the number one financial goal was saving to access better opportunities: education of their children, a home for their family, or the chance of opening their own business. The demand is clearly there, and most of the people we talked to were indeed saving. We heard from customers, and now we’re working with a mix of fintechs and financial service providers of all sizes to use those insights to create financial products that customers will want to use as key tools for their financial lives. Stay tuned! This research was conducted by Accion, the Center for Financial Inclusion at Accion, and Dalberg Design as part of our part of our Building Financial Capabilities and Strengthening Institutions through Customer-Centered Innovations project, supported by MetLife Foundation.